Hyperkin RetroN 3 Video Gaming SystemAs detailed in my previous blog post and video, Hyperkin is no stranger to creating low cost videogame consoles and portables. 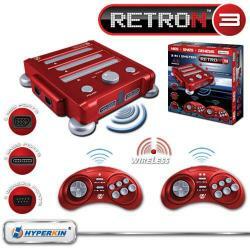 Their RetroN 3 Video Gaming System, which is detailed here, claims compatibility with Nintendo Entertainment System (NES), Super Nintendo (SNES), and Sega Genesis cartridges via its three cartridge ports and wireless Sega 6-button controller clone controllers. Hyperkin's previous products were plagued by d-pad issues and game compatibility glitches. UPDATE: This unit not only has the three different cartridge slots, but also three sets of two controller ports to match the respective original systems. That's certainly good news. Now all they need to get in order is the compatibility, since S-Video output (hopefully across all three systems, not just the SNES and Genesis) is standard (as well as stereo sound) and it actually could be a killer rig. Also, note that the $69.99 is the suggested retail price and the link is ONLY good for resellers at the moment, so there are still some specifics up in the air. I guess we'll know more after it's officially unveiled at E3 in June. Thanks to Marty Goldberg for the heads-up via Facebook.